This case study is about an anti snoring device called Smart Nora, sold through Shareasale affiliate network. As a rule of thumb, I don't promote anything that offers less than $20 commission. The recommendation I always read from other experienced affiliates is to promote very low cost offers. This advice makes sense in many cases, especially for newbies, to avoid burning a lot of money during the testing phase. 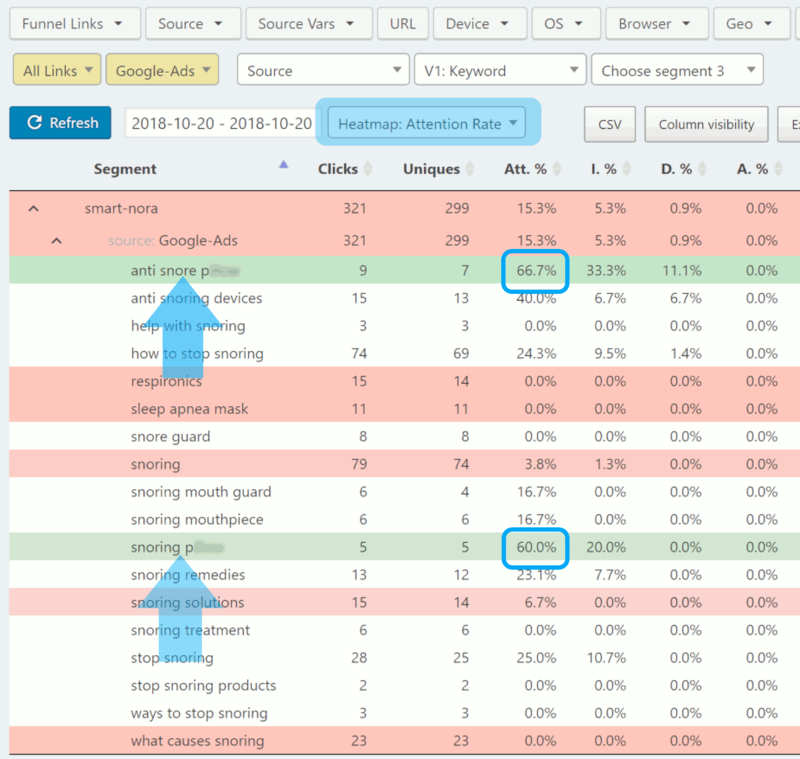 It's a way to track people activity on your pages (or vendor pages) to quickly find which placement/page combinations are most likely to be profitable, and which ones are most likely to be budget drainers. For example, if a visitor spends 20 seconds on your page, the A(ttention) is recorded. If he spends 2 minutes on your page, the I(nterest) is recorded. If he spends 5 minutes on your page, the D(esire) is recorded. And if he converts, the A(ction) is recorded. It makes sense that if a visitor doesn't reach the Desire trigger, he will not buy what you have to offer. 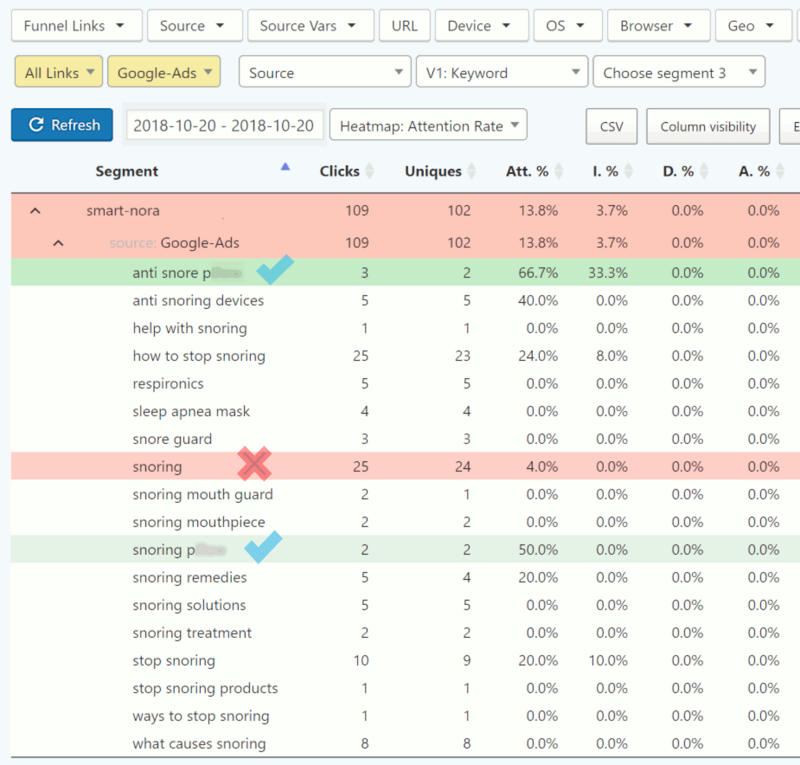 Tracking AIDA metrics mean that we can quickly find out if visitors coming from specific keywords are interested in what we have to offer or not. Disclaimer: I do not pretend that you will make any money - I am only showing you the AIDA process here. As you can see, at that point the campaign was bleeding money, losing almost $90, or 3 times the offer's payout... In just a few short hours! Even though I hadn't made any sale by then, I could see ClickerVolt predicted 2 keywords (the green ones) to be of much higher quality than the others. I could also see ClickerVolt predicted several would be flat out unprofitable (the red ones). Let's go back earlier in time, when I had even less clicks sent to this campaign. And it also predicted that the "snoring" keyword should be killed. Let's now look at the "Desire Heatmap" at that point in time. Very early, ClickerVolt was telling me to stop paying for "snoring" and "how to stop snoring". Now, you may wonder how ClickerVolt knew? (Re) Introducing... The Lost-Formula for Successful Affiliate Campaigns! Rule 1: Any keyword that has more than 10 unique clicks and less than 20% attention rate must be killed immediately. Rule 2: Any keyword that has more than 15 unique clicks and less than 15% interest rate must be killed immediately. Rule 3: Any keyword that has more than 20 unique clicks and less than 10% desire rate must be killed immediately. 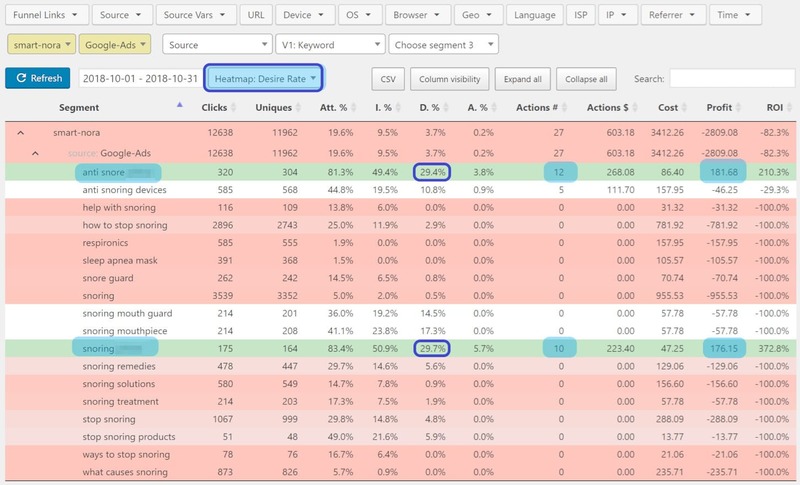 ClickerVolt's AIDA heatmaps automatically highlight these keywords. Following the three rules above ensures that we only target visitors interested in what we have to offer. The correlation between the AIDA metrics and the actual number of actions is striking! The 2 keywords that ClickerVolt predicted would be better than the others ended up leading to 22 out of the 27 actions. 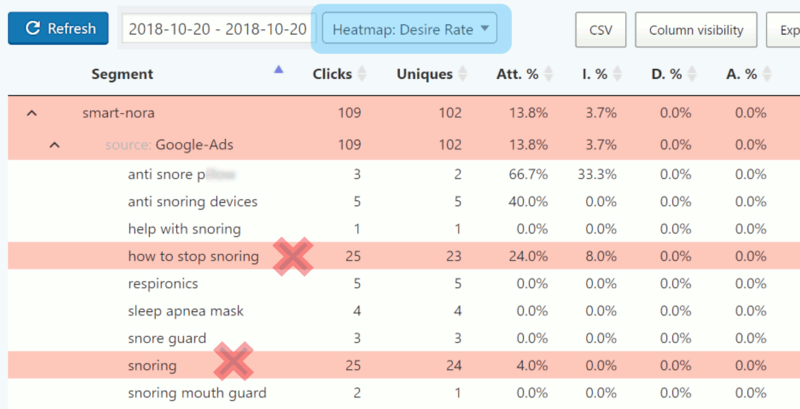 The only other keyword ("anti snoring devices") that led to the 5 remaining actions was not tagged as either bad or good by ClickerVolt. 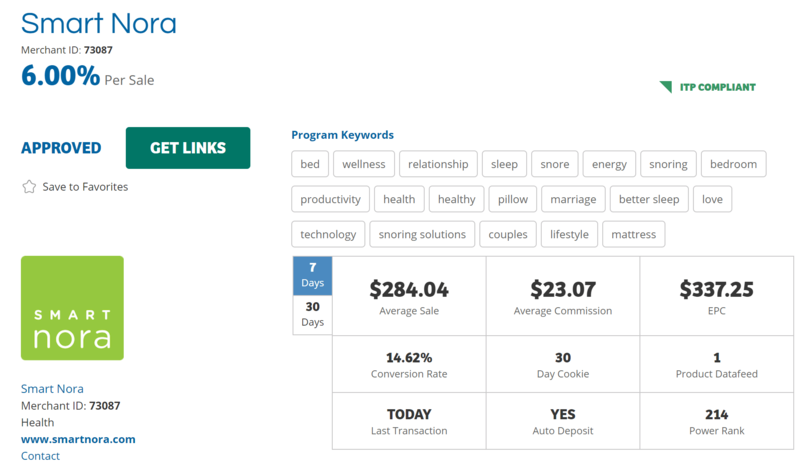 But even though it led to 5 actions, the cost for this keyword was too high to make it profitable. The 2 other keywords that ClickerVolt didn't tag as red or green are not bad either, but probably not suited to promote that specific affiliate offer. I may keep them (or you can steal them) to promote some snoring mouth guard offers instead! I am only showing you the AIDA process here. I just showed you how ClickerVolt could be used to create successful affiliate campaigns way faster, and with a lower testing budget, than with any other tracker. Yes, I want to give it a try now!